People used to pound cabbage to get it good and juicy for fermentation. Pounding isn't necessary when you let salt do the work instead! Makes 1 quart. Quarter and core cabbage, discarding outer leaves. Shred cabbage by hand or in food processor. Put in a large bowl and sprinkle with salt. Cover bowl with a tea towel and set aside for 30 minutes. Re-cover with tea towel and set aside for another 30 minutes. Remove towel and stir. It should be getting juicy. Transfer cabbage to a sterilized wide-mouth quart canning jar. Press down firmly to remove any air gaps and pack cabbage tightly (this works well). Fill jar to within 1 inch of the rim. Cover tightly with metal band and lid. During the first 24 hours, open the jar a few times to press the cabbage down beneath the level of the juices. Transfer to refrigerator or cold storage, where it will continue to age for many months. Enjoy! Have you ever made sauerkraut before? Will you try this recipe? I guess I’ll be up late tonight for the unlimited internet access so I can download the video! I love Beyond the Peel!! I look forward to seeing the video. Ah, thanks, Marg! I’m honored that you would stay up late to download it. 🙂 Beyond the Peel is a GREAT blog. Marg, it’ll be worth staying up for 🙂 Wardee shares some awesome ideas! I stayed up to watched the whole thing. Great interview! I have pretty much never fully “pounded” my sauerkraut and it is always amazing. I enjoyed your interview! I’m excited to try the sauerkraut recipe. I’ve been buying Bubbie’s sauerkraut but it would be cheaper to make it myself, especially if I succeed in growing cabbage this year (I’m a little doubtful). I have a feeling I’m going to end up buying your book, too. What’s the name – and where can one find – the wooden tamper you use in the photo to pack down the cabbage? I’ve used a wooden spoon but it doesn’t work nearly as well as a round, flat device like this one. I supose a bar muddler might work but this is much larger than any of those I’ve seen. That’s a Kraut Pounder, which I use only to pack jars. It is hand-made by the Eugene Oregon chapter of the WAPF. A beautiful tool! This looks like a great idea and I am sure a lot of people would want to try this.. Thanks! I am at work and all videos are blocked, so I’ll have to tune in later from home–I can’t wait to see it, and am shocked that this is my first introduction to Beyond the Peel! Can’t wait to learn more. In lieu of some leftover juice from a previous batch, I’m sure I could sub an equal amount of fresh whey? I know it might not make it juice as much (might also add some filtered water), but my hubby DRANK the last of the juice from my last batch of kraut! Oh, and if you haven’t tried it yet, mix in a handful of mustard seed to each batch–we swear that it adds a nuanced depth of flavor that plain cabbage doesn’t give. We LOVE our kraut on just about everything, and one of our favorite summertime meals is when I have one of those sourdough loaves that may be a bit beyond its prime, I’ll dice up a couple slices, and put them in a bowl with some fresh egg salad on top, then top it with the kraut. It’s like a deconstructed egg salad sandwich, served up with a spoon and lots of probiotics! Wardee, I have your book and I love it!, have been recommending it to everyone (see http://www.fivepondsfarm.com/RawFermentedFoods.html). But I was wondering: Some folks say you must ferment things like kraut 28 days to get the full probiotic benefit, and you are doing yourself a disservice if you put it in cold storage before that time. Does using the whey speed up the process so much that a 5, 6 or 7 day ferment is truly sufficient? Although…I noticed on this recipe that you don’t use the whey at all and it’s still ready in just a few days. My husband has major digestive issues caused by chronic illness and antibiotics, but he loves kraut and eats it every day, and I’m hoping that will help him on his way to being a healthier person. The probiotic benefits of the fermented foods are so important to us; I just don’t want to be short-changing him by “harvesting” our ferments too soon. Please give me your take on this. Thanks so much. Hello! I am sorry if this is an obvious question, but I am SO literal 🙂 I am wondering if this can be done in pint-sized jars as we don’t use it very fast. If so, how would you do that? Thanks!!! Tonya, I live alone and have limited storage space so generally prepare only very small quantities of ferments. It’s completely fine as long as you adjust the quantities accordingly. So, if you have a reasonable head for practical maths it’s no problem. I’ve also found that the recipes seem to have more natural ‘give’ than recipies you would use for baking etc. : if you don’t get the proportions perfect it’ll likely still work fine (and if it doesn’t it’ll smell and look so bad you’ll have no hesitation in consigning it to the compost bin). At the end of the day, the worst that’ll happen is you’ll waste a cabbage and a bit of salt – go for it! I feel silly asking this, but what does it mean to burp it? So, I have a batch of this on my counter right now (second batch…first exploded!). How do you know it’s ready for the fridge? Is it like kombucha, just move it when it tastes right? Or am I looking for something specific? I am on GAPS right now and spending about $15/week on Bubbie’s. If I succeed at making my own, it will save a bundle! When I made this, I was aiming for 4 quarts, but one jar was a bit short, so I just added some chopped onions and anaheim peppers, plus a little more salt to fill it. I tasted that batch before moving it to cool storage and I almost couldn’t part with it! So tasty, and it smelled nicer than the plain-cabbage batches. I love the ideas and gadgets to help with that question, but for those of us who are in the “meanwhile, what can I do with THIS batch?”, I’d like to point out that if you tighten a canning lid “fingertip tight”, it’s designed to let air escape, but not come in, correct? Because that is what happens during heat canning. I HAVE had ferments spill out liquid too and that is annoying, especially when enough spills out that you’re worried the veggies won’t stay submerged, but I think that is the worst catastrophe possible unless the lid was WAY too tight. I LOVED this easy method–thank you so much! 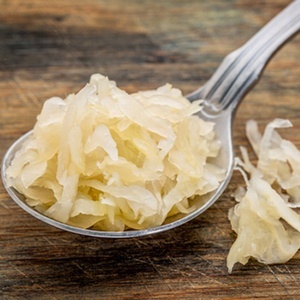 Does the sauerkraut lose its probiotic qualities if heated? In other words, how do we eat it? Since I cannot buy fresh cabbage because of the bug issue and Kosher dietary rules, what about vacuum packed pre cut cabbage from a greenhouse? Do you think it’s ok and will provide health benefits just as much as if I cut it myself? Hi Wardee! I use the pound method, so I’m excited about trying this today!! My question is, we usually store the finished product in our cool basement storage room. Do you think that is cool enough instead of the frig? Thanks!! Wardee, is it okay if the fermenting jar is only half full? If the jar isn’t full, be sure to have the veggies completely covered in brine. You may need to add a weight (such as a full cabbage leaf) to help hold the veggies under the brine. So in one hour the wild ferments get in the cabbage thru the towel? Otherwise Im not understanding where the probiotics come in so they grow and culture the cabbage & sliced onion, garlic, shredded carrot, etc… Thanx! Helene — The wild organisms are right on the cabbage, so no need to get through the towel. Most fermentation happens with organisms present on the food. Enjoy! I’ve seen other recipes call for a probiotic capsule opened up into the mix. Is this just to further inoculate the ferment you’re making or to introduce different strains than what might be in your kitchen or…? 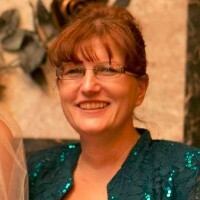 Helene — You can jumpstart your ferment and ensure a good result by adding a starter culture such as a probiotic capsule. That’s why people do it. It’s not necessary but it can help ensure more consistent results. Especially if the vegetables are not organic. You can drain some of the brine and replace with cool water. That should help with the saltiness. You do want it to have some crunch to it. 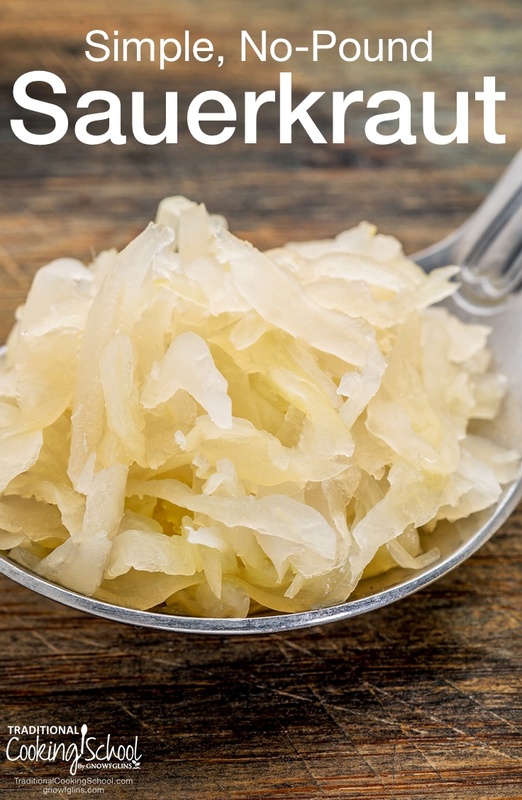 If sauerkraut is dehydrated does it lose it’s probiotic goodness? How would be the best way to store it after dehydration? It doesn’t lose probiotics when dried, but it does lose its crunch. A better way to save it is to freeze it. How much time does this method save? Or basically, how much time would it have taken to pound the kraut instead? Another question, why not just fill the crock with the salted cabbage instead of using the bowl? It seems feasible. Amy ~ As I’ve never pounded kraut, I’m not sure. I’ve heard people say they pounded for awhile though… 30 minutes? Thank you so much for all the information you share. I got brave enough to try my first ferment, kraut. Canned kraut is too strong to me, I like it in VERY small amounts with meat. My husband loves kraut. Neither of us had ever tasted homemade kraut, so we weren’t sure what to expect. Yesterday we were finally able to dig in to our jar of kraut that was 8 days old. I absolutely love it! That is the most kraut I have ever eat in a setting. My husband thought it needed to be stronger, but liked it. I am going to let the rest continue to ferment for him and see if he likes the taste better. I am so excited! I never thought I would make something like this. My next ferment is going to be Kimchi. Thank you SO much! I have a conundrum. I had a friend come and pound 15 pounds of cabbage for me, only to learn it didn’t need to be done. That is ok, we can learn, but my husband got a large glass vase off the top of the refrigerator, filled it with water, and set it on top of the plate that I had down in the crock to weight it down. You would think – all fine and good – but he didn’t wash the outside or the bottom of the vase. I’m sure it was dusty, though he said he didn’t see any dripping off(you know how nasty tops of refrigerators get). I thought I would cry. Do you think the fermentation process will take care of something like this, or do I need to start over? After 4 days it has some white foam…otherwise seems good…? Can I trust it? Ferments can sometimes foam. If it smells good and otherwise looks good it’s likely fine. Do you see any foreign objects floating around? If not, I wouldn’t worry too much about the vase at this point. I finally tried my first batch of this stuff today. It’s so good I ate a whole bowl plain. I need to get some more started, pronto! Thanks for this easy no-fuss recipe. Would you please give the amount of cabbage as a weight? Your idea of a medium cabbage and mine could be different. thanks. I am happy to help. 1 medium-size cabbage will weigh around 2 pounds. I see that your recipe calls for a very short time to ferment…. I was seeing much longer times online and am a little confused. How long should sauerkraut ferment? Can it ferment too little? Is 1 week enough? Most places were saying at least 2-3… Any help you can give me would be great. Thanks!! Fermentation has many styles. I prefer to ferment one week at room temperature and then possibly several months aging in cold storage. Others do 2-4 weeks at room temperature. It’s really up to you and your preference. My experience with fermenting longer than 1 week at room temperature is increased chance that the kraut will get mushy. Wardee, thank you for this recipe and method. I’ve tried it and have enjoyed success. I prefer sauerkraut with a more pronounced “sauer” element, a stronger flavor. I don’t want to compromise the texture of the kraut. Is there a way to achieve a stronger flavor while maintaining the crunch? Thank you and God bless. Thank you, Peggy. This answered my questions. I must have overlooked this video; I’m glad you pointed it out and included the link! Have a great afternoon. Time for me to get fermenting!